In early September, the Kensington & Chelsea council joined Kensington Society’s campaign to halt the erosion of police services through draconian budget cuts. At the same time, the campaign has grown. It now has its own website and and more than 2,000 have so far signed the 38 Degrees petition. All across northern Kensington a flyer is being distributed as part of the campaign. A quick background: The latest government demand for police savings means that the Met has to save a further £400 million during the next four years, in addition to the £600 million saved since 2010, mainly thorough the closure of 76 police stations. This has resulted a savings proposal from the Mayor’s Office for Policing And Crime (MOPAC) which would mean the closure of a further 41 police stations, leaving only one in each London borough. For Kensington, the plan is to close and sell off the Notting Hill police station, and to close the Lancaster Road (Royalty Studios) and Kenway Road (Earl’s Court) safer neighbourhood bases. The only remaining station in the borough would be Kensington police station at the top of Earl’s Court Road, off Kensington High Street. The Kensington Society campaign, which focusses on the proposed closure of the Notting Hill station and questions some of the planned changes to neighbourhood policing, has expanded significantly since it began in late August. In addition to the original 38 Degrees petition, there is now a dedicated campaign website, and leaflets and posters are being distributed across the northern wards, as those are the ones most affected. 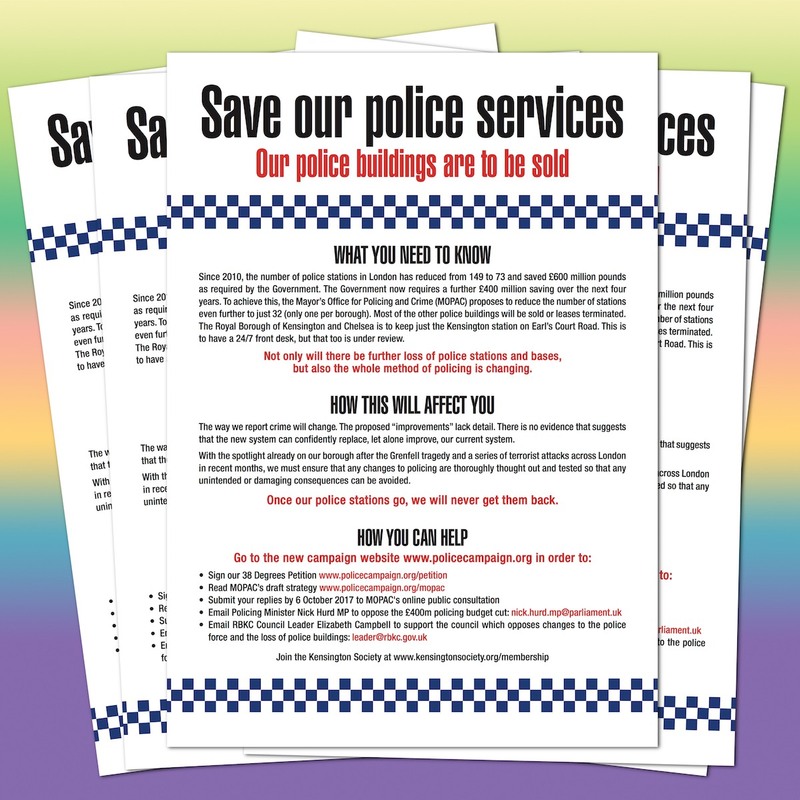 The council’s decision to join the campaign can be found in a press release from 6 September, the same day that the leader of the council, Elizabeth Campbell, sent a letter to MOPAC, where she stresses that council “is extremely concerned” about the proposal to close police stations and safer neighbourhood bases. The letter acknowledges that the network of “contact points” – established during the last round of cuts to compensate for closed police stations – has failed, but points out that the failure has been due to a combination of poor public knowledge about these contact points and an unease by many to have a face-to-face conversation with the police in a public space. However, the letter questions the idea that replacing those contact points with a network of “community contact sessions” in public spaces would solve this problem, as the draft proposal doesn’t acknowledge the reasons for the failure of the contact points, nor explains why the new system would be any better. The letter remarks that a closure of Notting Hill police station would mean that the borough, which four years ago had three police stations (Chelsea, Notting Hill and Kensington), soon would have only one. It also points out that the consultation document clearly states that “no front counter with more than four daily crime reports is being closed” (page 25), while the document at the same time states that the Notting Hill station has 4.2 daily crime reports. The background to this is that the consultation paper, as a sort of viability test, lists the number of visits per day each station has had from people reporting crime. However, as the document shows, people also visit police stations for a range of other reasons. In fact, reports about crime only account for 18% of police station visits in London. But the document dismisses the remaining 82% of visits, stating that they “are not activities which need to take place at police station front counters”. In our society, as in most other democratic nations, uniformed policemen are the only visible representatives of the authorities, and patrolling policemen and police stations have always been seen as helpers for various issues beside crime. If the police is not the authority to deal with such matters, which authority will be given the necessary financial and staff resources to take over those functions? Enabling people to do some of this online, instead of being forced to visit a police station, is a positive measure, but many things require a face-to-face meeting with a police officer and the possibility to discuss things in private, and there are also many who prefer visiting a police station or do not feel comfortable using online services or talking to an anonymous police representative over the phone. 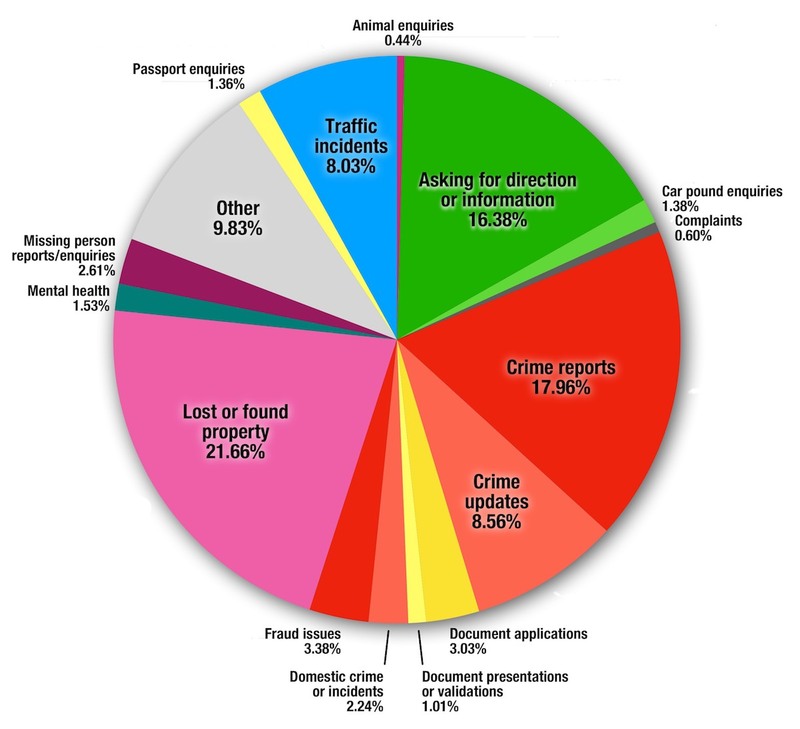 There is also the almost 20 million annual visitors to London to consider: for them it’s much easier to visit a police station than to use phone or the internet. It’s important to stress that the proposal isn’t what the mayor, MOPAC and the Metropolitan Police want, but their attempt to present a solution to the savings demands, as required by the government. London’s mayor, Sadiq Khan, has repeatedly argued that the cuts will be very damaging for London. So an objection to the proposal should not be seen as criticism of the mayor or the Met, but a support to their fight against the budget cuts. As the decision ultimately lies with the government, we urge the RBKC council to lobby the government to reconsider the proposed cuts. The new campaign website can be found here. It contains links to the 38 Degrees petition for those wishing to sign it, as well as links to the public consultation, for those wanting learn more about the proposal and/or wishing to comment it. The public consultation closes on 6 October, but the petition will be available for signatures until MOPAC has looked at all comments and reached a decision.